Introducing our fab new breaded range! 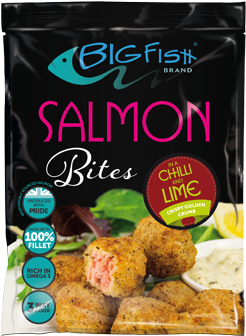 We are delighted to announce the launch of our fantastic Salmon Bites and Goujons! 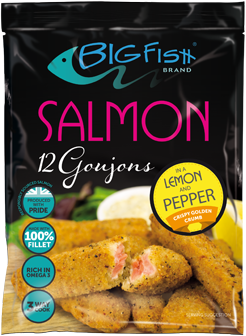 Everyone loves fish fingers, chicken goujons and scampi so now let us introduce our fantastic new salmon alternative - the BigFish Brand Breaded range! 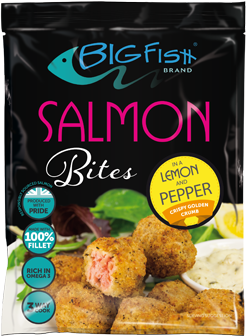 We have six brand new, ultra-convenient products, all made with with Omega3 rich salmon fillet and coated in a light, crisp golden crumb. Choose your favourite shape - either Bites or Goujons - and select either our great tasting plain breaded crumb or one of our two fantastic flavours: Lemon & Pepper or Chilli & Lime. 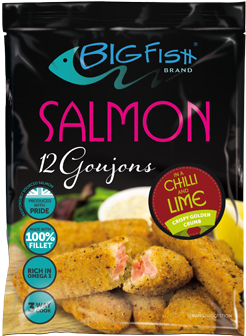 Cooking in minutes from frozen, these products are perfect fast fish for lunches, midweek meals or supper, even for feeding the kids to make sure they're getting their regular portion of Omega3!